The lovely Ladies (and Lady-lovers) in Oregon City have received the go-ahead from the Urban Renewal Commission to convert their deserted Amtrak station into a thriving center for bikey goodness and tourism. Wonderful! The city-owned station at 1757 Washington St. is vacant and is served by a few trains per day. The historic building, once the town’s freight depot, lacks any glimmer of life. There’s no inside seating, no one on duty, no snack bar, vending machines or payphone. Meier wants to convert the building into a comfortable way station for visitors, especially those who arrive with bicycles. The Amtrak station would be a hub that would directs people to destinations around the city and county, said Adam Beykovsky, who is working with Meier. “The idea is to push people out into the community,” Beykovsky said. Cities embracing Ladies are seeing the benefits to their economies (another example of that here, too), not to mention the benefits to everyone’s quality of life. Lovely! Facilitating bike commuting, travel, vacation, and fun is in the best interest of any forward-thinking, and economically competitive, town or city. Way to go, Oregon City! I know I’ll be checking out this hub (pun-intended) once it’s up and running. 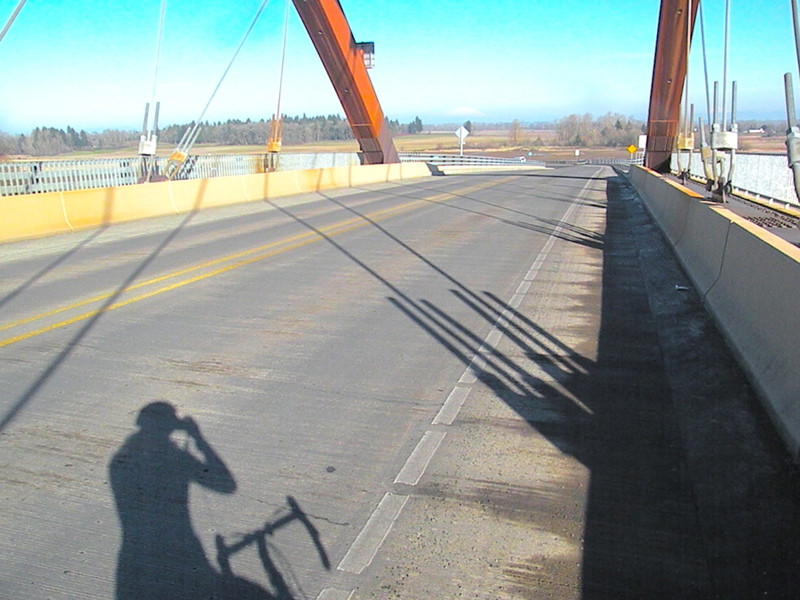 The Sauvie Island bridge on my sunny, MLK Jr. Day ride. St. Helens within view, bike between my legs. Lovely! Till then, what places do you like to bike for the sheer joy of it? Sauvie Island is an easily accessible, nearby location I try to visit and appreciate on a regular basis. Ladies from other cities: what natural features and rides are near you? Keep riding, investing in local economies, and building community, Ladies! IT’S OFFICIAL: THE WOMEN IN THE WOODS PODCAST!